I spotted this on the Superdrug site, it seems a bargain for the holidays - thought it might be of use to others too. It's £11.76 at Amazon! 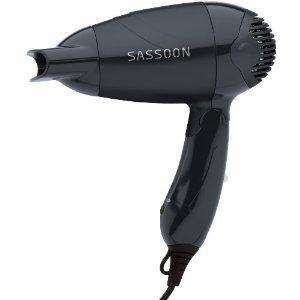 Sassoon’s travel dryer makes sure you can still achieve the perfect blow dry--even when you’re on the beach and a million miles from your nearest salon! This lightweight dryer will fit into the smallest of luggage spaces, folding away neatly to make it the perfect travel companion. With 1200 w of power, 2 speed settings and an airflow concentrator nozzle, there really is no excuse for unruly holiday hair. 1200 w power with 2 speed and heat settings. It features airflow concentrator nozzle for precision styling, worldwide voltage--suitable for use in all countries and folding handle and hang-up loop for convenient storage. Good deal if you could get it but unfortunately its out of stock!!! Blimey - that was quick! I'll mark as expired. Aww - no worries, i'm glad that you found it useful. I've had a despatch email too I hope you have a fab holiday!